Jennings & Keller perform a special Earth Day concert to benefit Florida Conservation Voters at UU Miami. Opening the show is local favorites ‘Three Sheets To the Wind’. $15 tickets; $12 advance. 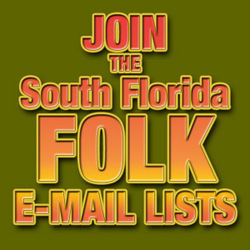 7:00 p.m. e-mail Mike: MikeLRM3@gmail.com or call 305-667-3697. 7701 S.W. 76th Ave. Miami.